Someone who made me feels comfortable and who was easy to talk to, friendly, patient and convenient. Learning was less stressful than I anticipated. However driving was more difficult than I thought. The instructor Brandon’s teaching methods were faultless. Couldn’t ask for a better instructor friendly and easy to get along with. 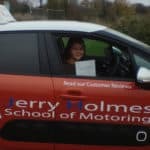 I needed to find an instructor that was friendly and the cost of the lessons at a reasonable price. It wasn’t as hard as I thought but it was fun. The teaching methods were effective and easy going. 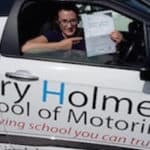 I would recommend this driving school. 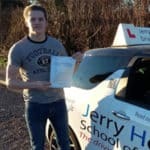 Jerry is a very calm and thorough instructor, he explained everything really well and made me feel very comfortable. He took the time towards the end of my lessons to ask if there was anything I wanted to cover. I would definitely recommend Jerry to friends and family. He is a great instructor and makes you feel completely at ease and confident. I was looking for good reviews and was recommended. I also knew by the website they have good pass rates. I had already driven a moped, so had same experience on the road but driving a car is different. 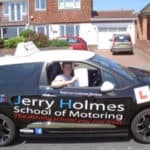 Jerry was good at passing his teaching methods on to me and explains them to me which speeded up the learning; I would recommend Jerry Holmes Driving School because of the teaching methods thanks Jerry. Jerry my instructor, who is reputable with excellent customer feedback, who I could feel at ease with, two other things were the Cost which is important but also availability. That my lessons can fit around my work and sons school hours. 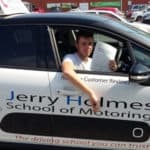 The lessons were as I expected, as I had previous driving experience, however the test was much harder and stressful than I expected but Jerry was Excellent, very patient with an excellent teaching technique. He Adapted my lessons to my requirements. 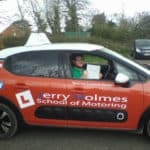 Jerry is an extremely good teacher and I would recommend him to anyone. 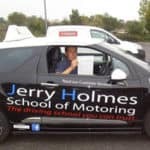 I chose Jerry Holmes Driving School because Jerry’s driving lessons were easier than I thought it would be. Because he was patient with my driving lessons and allowed me to learn at my own pace. 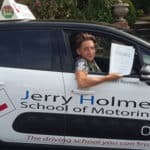 Yes I would recommend Jerry as a Driving Instructor as he will help them to progress and eventually pass regardless of their skill. 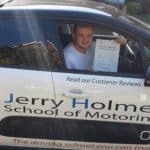 Jerry was very calm and patient and he explained every manoeuvre perfectly. He was very organised and told me in advance of each lesson what his plan was for the following lesson which prepared me for new challenges. He was very encouraging and used positive language always. His teaching methods were brilliant and I am pleased that I found him! 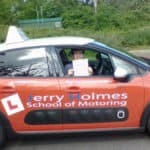 It’s needed a lot of patients , focus and concentration Jerry can understand the learner’s driving knowledge and skills and provide the best method to teach the lesson. He is patient and has good communication skills. 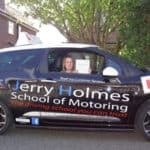 Yes I would recommend Jerry Holmes Driving School because if a learner driver does not learn the lesson in the first attempt, he has a lot of patience while teaching and repeat the lesson and there’s time to explain the lesson in different ways. He always teach the lesson according to the learners ability. 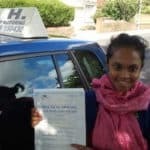 I was looking for Quality service and a good driving school with Good reputation and relatively good value for money. 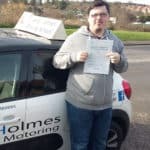 My experiences of learning were made a lot easier thanks to my driving instructor Brandon and was a lot more fun than I expected. Teaching methods were excellent! 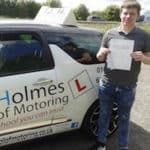 I started learning to drive with no knowledge at all and managed to pass first time because he knew exactly what needed to be done. 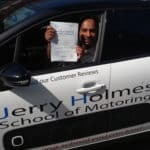 I would recommend Jerry Holmes Driving School, Definitely, because it was a much better experience than I thought it would be and everything I needed to know was given to me. 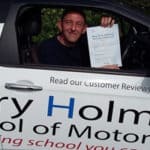 I was looking for a driving instructor who was sensible and explained things and who made the learning fun and not a chore. 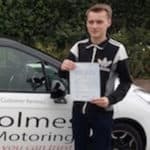 He was very professional with all his instructions and walked me through the whole process of joining his school and all the associated paperwork through to the actual driving lessons themselves. He was always very helpful when fitting me in around my busy work life. He is like that teacher at school who you actually looked forward to instead of dreading. He doesn't shout if you do something wrong but takes the time to explain what you have done wrong and how to improve. If you’re looking for a gd instructor you would not be sorry going with him as he is not just good but can say he is a great instructor. He seems to love what he does and is not just in it to make money unlike some of the horror stories around driving schools/instructors. The office staff will run you through everything from beginning to end and they are just as friendly as Jerry himself. 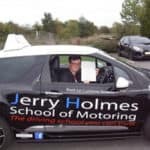 I prefer Jerry Holmes School of Motoring because of the comfortable training for me. 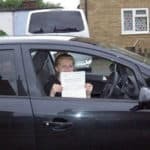 Other factors of the driving school are very good teaching, polite, being on time. 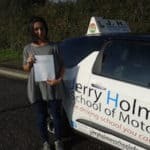 And very comfortable with Jerry the Instructor as well my learning was very comfortable and more pleased than I expected as the teaching method where Excellent, and understanding. He was comfortable for me so he will be for others. 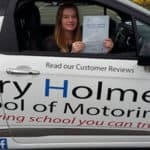 I was recommended to this driving school. The price of the lessons are really good. Instructor is easy to get in touch with. Brandon was always so reliable, Always made you feel comfortable and not nervous and Patient with you. Enjoyed doing my lessons with him all the time. I expected it to take me ages to learn and to pass. I learnt quite quickly with Brandon. It took a good time to learn and to be good at driving. He was Absolutely amazing. Always so patient. taught step by step to make it easier, never rushed. 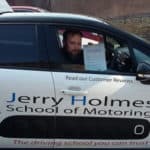 Yes of course I would recommend Jerry Holmes Driving School. Brandon was welcoming patient and helpful. 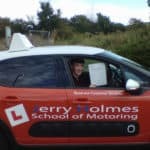 I started my driving lessons very nervous but Jerry was very friendly and made me feel comfortable with the lessons he was very polite and understanding and helped me with my strengths and weaknesses with driving and gave me a lot of support and taught me how to be safe on the road if you’re looking for an instructor I would recommend Jerry Holmes driving school to anyone wanting to learn how to drive. 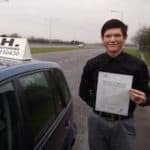 I had Brandon as my instructor and he was fantastic, he got my nerves calmed and had a great positive attitude and got my up to test standards and more and I were able to pass first time which was great. 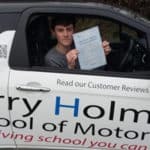 I would highly recommend this driving school. 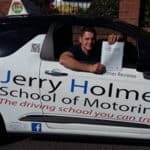 I chose Jerry Holmes Driving School because I found my lessons were challenging but good and Jerry was brilliant. 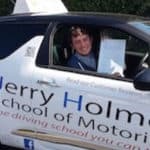 I am dyslexic and have autism but, he helped me through the difficult times of my driving lessons. 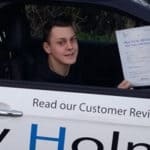 With his calm and laid back nature I am proud to own a full driving licence. Yes and I would recommend him to all my friends. It was much easier than thought I found Jerry very patient and he encouraged me when I lacked confidence. He was willing to practically and theoretically explain things and he focused on my personal strengths and weakness. Yes I would recommend Jerry, he was friendly and patient. He remained calm and always had a smile. He understood my personal needs and tailored the lessons to suit me. 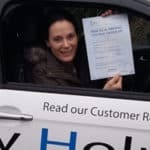 Personally, I believe that the most important criteria for when choosing a driving instructor is experience and patience. 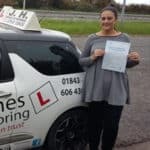 This is because, as a beginner driver you need someone that has had their fair share of experience and has the know how to teach others .From personal experience, patience is also a key factor, as not everyone is a natural when it comes to driving. 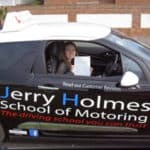 A driving instructor needs to realize that and adapt to the student’s needs, which was demonstrated on many occasions with Jerry. I thought I was going to be an unteachable student at the beginning; this is because I am a slow learner, especially when it comes to simultaneously controlling all the different internal controls inside the car. 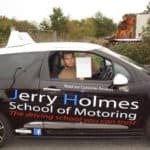 My driving instructor Jerry, he’s methods were easy to understand and grasp, this claim can be supported by the countless years of driving experience he has gained and demonstrated to me and others. I have already recommended you to several of my friends and family. I have told them about your teaching methods and how much experience you process, they have all since gained interest in your school. Personally, there is nothing to improve upon, as you have showed exceptional customer service and support in our lessons. 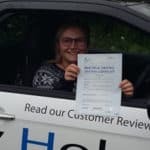 The most important criteria for me in choose a driving instructor was that there be mutual respect between the instructor and I. 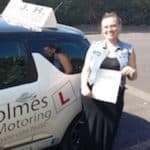 Other factors that were important to me when choosing my Driving Instructor was that the instructor was very competent and able to give instruction in a way that responded to the way that I learned best. 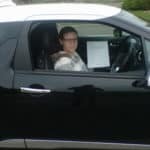 How did learning to drive compare to what I expected? I was very pleasantly surprised. When I took my lessons, I had already been driving for over 40 years. I learned A lot! And I became conscientious and attentive to the road and my environment in a way I simply wasn’t before. I would say I’m a much safer and more competent driver than I ever was. How did you find your instructors’ teaching methods. What I appreciated was that Jerry gave me several suggestions for ways of learning that might work for me. These included observing him driving, to providing commentary on my own driving, to watching video, and recording and watching my own video. It quickly became apparent which method was most beneficial for me. I appreciated Jerry’s willingness to follow the method I wanted, but also his sensitive coaching when he felt strongly that other approaches might be of particular benefit. 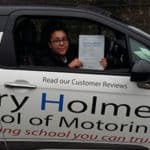 Would i recommend this driving school why? Absolutely. There can be no higher recommendation than that I recommended that both my children take lessons from Jerry’s School of driving. 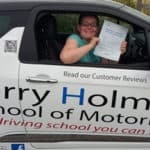 I am clear that the instructor was highly competent as a driver, but also particularly able as an instructor, in understanding the best way to have me learn. Jerry practiced the perfect balance between being uncompromisingly straight with me when that was required, and giving me room to make mistakes. I always felt encouraged as well as challenged. I believe I got driving instruction of the highest calibre. I was looking for someone who was supportive and offers encouragement to boost my confidence. 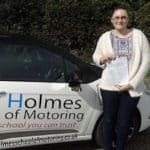 I needed a driving school that was able to offer a suitable time for me around my school. Learning was a lot more factors to consider than I expected. A lot of concentration was required for observations. Brandon teaching methods really helped me as there was structure to my lessons and everything was clearly explained. 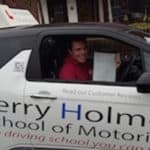 Yes, I would recommend Jerry Holmes Driving School friendly service. My previous driving experience had not been good until I found Jerry, who made my driving calm and peaceful. Jerry had a very friendly and calming approach to driving. Jerry is good at explaining things I didn’t understand and has made my overall driving experience very pleasant. 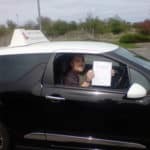 Yes I would recommend him to friends and family because Jerry is an excellent and professional driver, who is very patient and understanding. 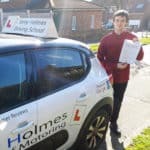 Hi everyone I passed my practical driving test and just want to say a few words. I’ve been driving for about three years and did give up at one point which was the worst mistake in my life. 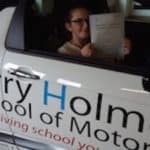 My theory test expired today and I passed my practical driving test today and that says something, never give up. Jerry didn’t give up, my parents didn’t give up, and you yourself do not give up. It’s the worst mistake you can make. 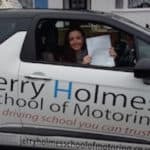 Hope you can pass as well thank you … and Jerry is the best driving instructor I’ve ever had. I felt more relaxed than I expected. Really good, the methods of teaching used made it clear for me to understand what I was doing. Yes, I had a really enjoyable experience learning to drive. I never felt under pressure and I loved how everything was explained to me in such detail. 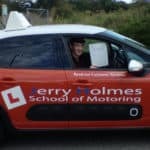 I thought you were an excellent instructor Jerry as you were very calming and made me feel relaxed, although it may have taken some time to pass, I definitely feel like a safe and good driver now and I thank you for that as I feel that without your experience and knowledge, I may not be able to handle situations the way that I should do. 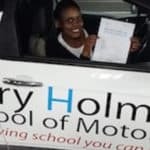 The most important criteria for me were that I would have a good teacher and I would become a good driver on the roads. That it wasn’t too expensive and was local to me, so I would know the area I’d be learning to drive in. It made it less scary. Learning to drive was better than I expected. I was worried that everything would be really complicated and that I would be really bad at it. I found the teaching methods really good. Everything was explained to me. 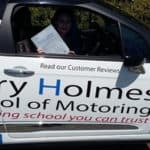 What an amazing instructor, with patience knowledge and a friendly manor to make learning to drive effortless and fun! I had such a great time learning to drive with Jerry and I am so thankful for all he taught me to pass my test. 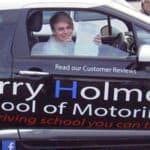 I would recommend 100% to anyone such a great driving school 5 Star. 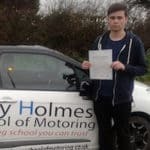 To find a Driving School with a good reputation. Good records and are trustworthy also found the price a good value for money. 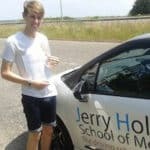 Driving was more straightforward than I expected but there was lots to remember but I found it informative and fluent with the techniques. 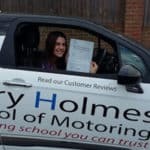 Great driving school, I enjoyed my time. I needed to find an instructor who helped me to overcome anxiety from my previous instructors I had. I needed to learn how to drive to the correct standard. With Jerry my Instructor I felt comfortable. Learning to drive was almost like a bridge I couldn’t cross to begin with and I expected it would take me forever to learn. 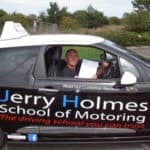 Jerry has been absolutely outstanding throughout my driving lessons. If there was something I was getting wrong, he had multiple ways of approaching the subject to me. 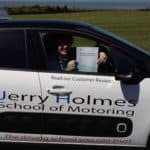 I would definitely recommend because, without Jerry I would still be trying to learn and I believe no matter who you are, Jerry can makes you comfortable and teach you in a way that suits you. I found my lessons were a present. Trustworthy patient also Understanding enjoyable and calm. My instructor Brandon made it very easy and helped a lot with my driving. If it wasn’t for Brandon I would not be a good as a driver today. 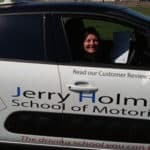 Yes, I would recommend Jerry Holmes Driving School because this school is amazing. 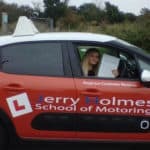 The most important thing for me was an instructor that was calm and friendly, as I felt nervous about learning to drive. 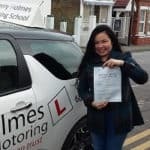 Other important factors for me were a driving instructor with experience and a good knowledge to help me become confident and comfortable on the road. 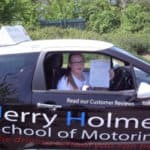 My driving instructor Jerry helped me to become confident and comfortable through being patient. 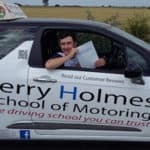 I didn’t expect to learn methods so quickly, my lessons were always structured and in decided what I wanted to learn, which I didn’t expect but I did benefitted massively from. 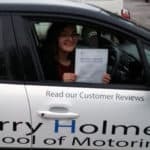 I learnt knowledge beyond passing the test which has made me feel more confident in my driving. 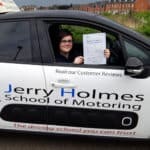 I was always concerned about teaching methods as my sister had an instructor (with another company) that ended up putting her off her lessons. However my instructors teaching were structured. So I had a plan, I always knew where I needed to improve. My instructor provided a learning that suited all, by providing diagrams, drawings and welcoming to teach in the best methods for the individual. 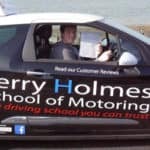 Yes, I would always recommend Jerry, as he was a fantastic instructor who was calm and patient with the experience and knowledge. 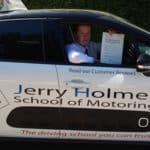 Anyone who has jerry as an instructor is lucky I couldn’t fault my learner experience with Jerry Holmes School of motoring. I will be forever grateful to jerry for teaching me to drive! 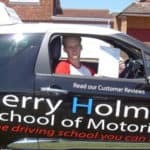 I was looking for a local driving school and the cost of the prices was great. It was less stressful than I expected, as Brandon was a good driving instructor. Brandon’s teaching methods were perfect, no problems. 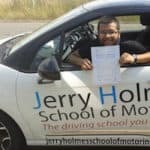 I would recommend Jerry Holmes Driving School and yes because Brandon is brilliant.